California governor declares emergency for southern Napa County. NAPA, Calif. — The largest earthquake to hit the San Francisco Bay Area in 25 years sent scores of people to hospitals, ignited fires, damaged multiple historic buildings and knocked out power to tens of thousands in California’s wine country on Sunday. The magnitude-6.0 earthquake that struck at 3:20 a.m. about 6 miles from the city of Napa ruptured water mains and gas lines, left two adults and a child critically injured, upended bottles and casks at some of Napa Valley’s famed wineries and sent residents running out of their homes in the darkness. 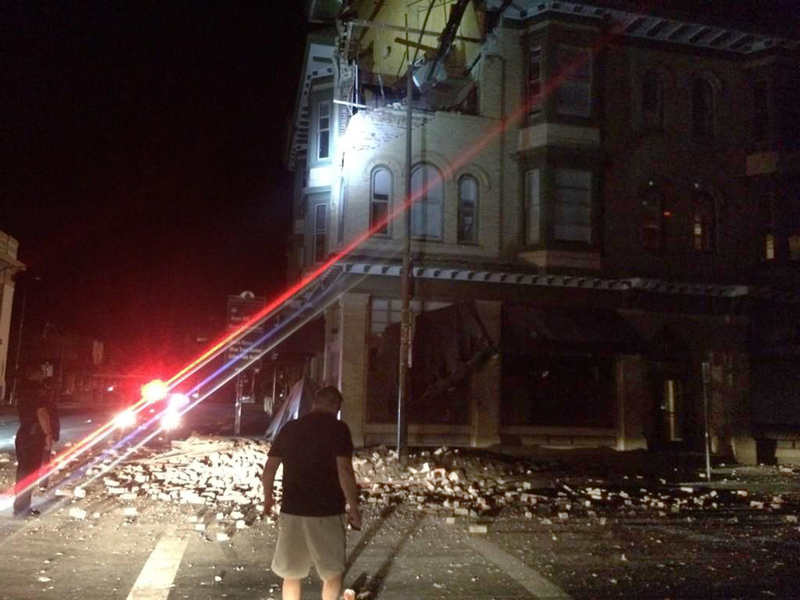 Dazed residents too fearful of aftershocks to go back to bed wandered at dawn through Napa’s historic downtown, where the quake had shorn a 10-foot chunk of bricks and concrete from the corner of an old county courthouse. Bolder-sized pieces of rubble littered the lawn and street in front of the building and the hole left behind allowed a view of the offices inside. College student Eduardo Rivera, 20, said the home he shares with six relatives shook so violently that he kept getting knocked back into his bed as he tried to flee. “When I woke up, my mom was screaming, and the sound from the earthquake was greater than my mom’s screams,” Rivera said. 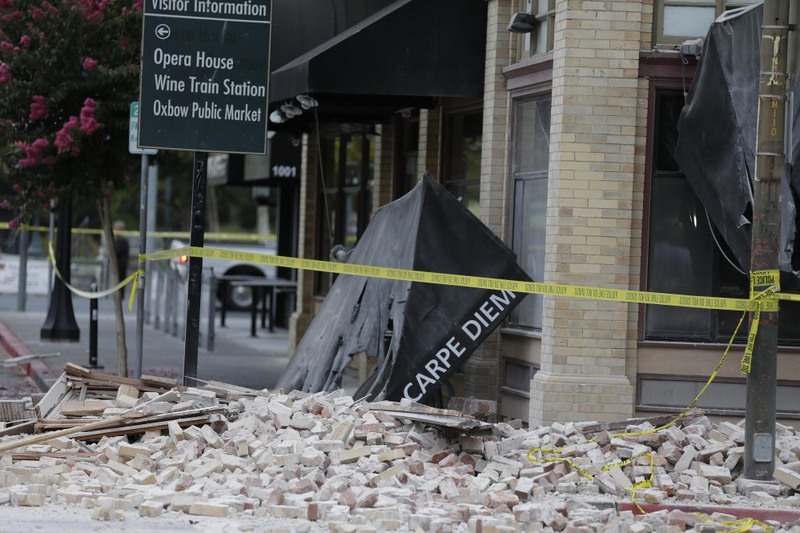 While inspecting the shattered glass at her husband’s storefront office in downtown Napa, Chris Malloy, 45, described calling for her two children in the dark as the quake rumbled under the family’s home, throwing heavy pieces of furniture 3 or 4 feet and breaking them. “It was shaking and I was crawling on my hands and knees in the dark, looking for them,” she said, wearing flip flops on feet left bloodied from crawling through broken glass. President Barack Obama was briefed on the earthquake, the White House said. Federal officials also have been in touch with state and local emergency responders. Gov. Jerry Brown declared a state of emergency for southern Napa County, directing state agencies to respond with equipment and personnel. Napa Fire Department Operations Chief John Callanan said the city has exhausted its own resources trying to extinguish six fires, some in places with broken water mains; transporting injured residents; searching homes for anyone who might be trapped; and answering calls about gas leaks and downed power lines. Two of the fires happened at mobile home parks, including one where four homes were destroyed and two others damaged, Callanan said. The earthquake sent at least 87 people to Queen of the Valley Medical Center in Napa, where officials set up a triage tent to handle the influx. Most patients had cuts, bumps, bruises, said Vanessa DeGier, hospital spokeswoman said. She says the facility has treated a hip fracture and heart attack, but it’s unclear if it was related to the quake. The child in critical condition was struck by part of a fireplace and had to be airlifted to a specialty hospital for a neurological evaluation, Callanan said. The earthquake is the largest to shake the Bay Area since the magnitude-6.9 Loma Prieta quake in 1989, the USGS said. That temblor struck the area on Oct. 17, 1989, during a World Series game between the San Francisco Giants and the Oakland Athletics, collapsing part of the Bay Bridge roadway and killing more than 60 people, most when an Oakland freeway fell. 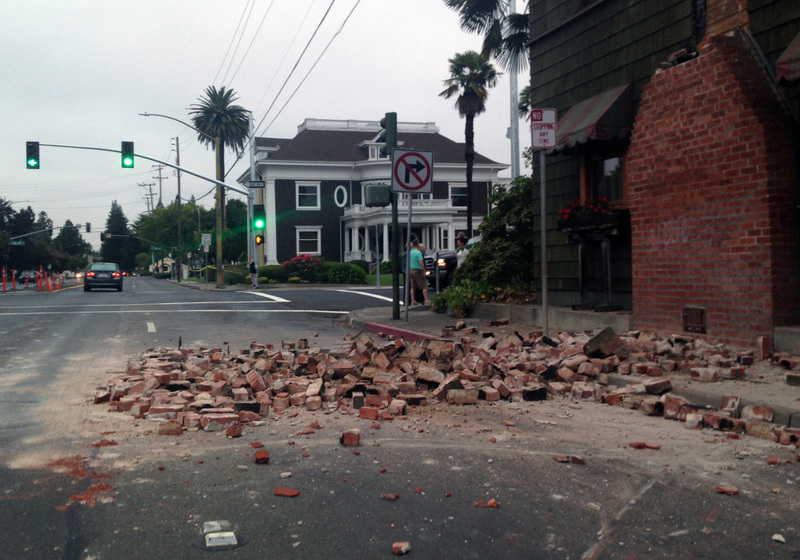 Sunday’s quake was felt widely throughout the region. People reported feeling it more than 200 miles south of Napa and as far east as the Nevada border. Amtrak suspended its train service through the Bay Area so tracks could be inspected. Napa City Manager Mike Parness said at an afternoon news conference that 15 to 16 buildings were no longer inhabitable, and there was only limited access to numerous other structures, mostly ones with broken windows. Officials say they are still assessing buildings in the area. 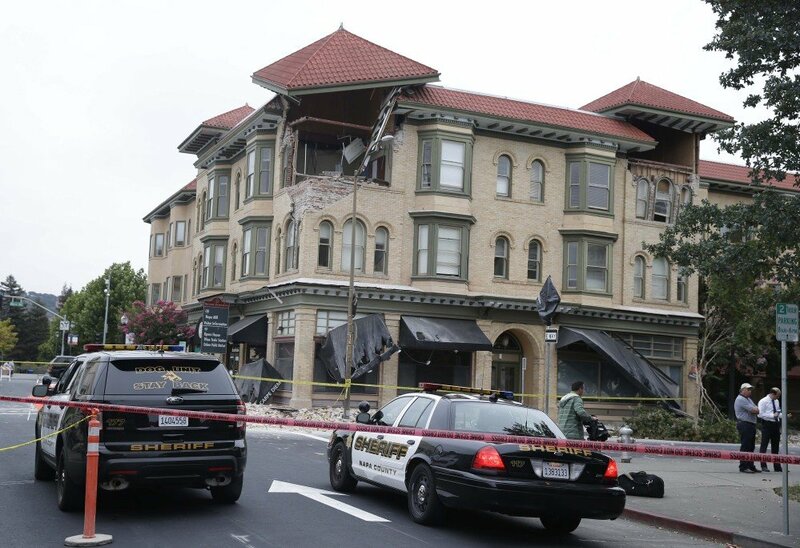 In Napa, at least three historic buildings were damaged, including the county courthouse, and at least two downtown commercial buildings have been severely damaged. A Red Cross evacuation center was set up at a high school, and crews were assessing damage to homes, bridges and roadways. Bridewell said he had to climb over fallen furniture in his own home to check on his family before reporting to duty. The shaking emptied cabinets in homes and store shelves, set off car alarms and had residents of neighboring Sonoma County running out of their houses and talking about damage inside their homes. Pacific Gas and Electric spokesman J.D. Guidi said close to 30,000 lost power right after the quake hit, but the number was down just under 19,000, most of them in Napa. He says crews are working to make repairs, but it’s unclear when electricity would be restored. The depth of the earthquake was just less than 7 miles, and numerous small aftershocks have occurred, the USGS said. “A quake of that size in a populated area is of course widely felt throughout that region,” said Randy Baldwin, a geophysicist with the U.S. Geological Survey in Golden, Colorado. California Highway Patrol Officer Kevin Bartlett said cracks and damage to pavement closed the westbound Interstate 80 connector to westbound State Route 37 in Vallejo and westbound State Route 37 at the Sonoma off ramp. He says there haven’t been reports of injuries or people stranded in their cars, but there are numerous flat tires from motorists driving over damaged roads.